We have several time tracking tools on the market. Which will provide more features to make work on the projects, time recording and billing clients better experience? TimeCamp or Toggl? Also look at the Toggl alternatives. TimeCamp (www.timecamp.com)is an automatic time tracking software. It is useful for big teams and individuals as well. Timecamp is an app that tracks time based on computer activities even if someone forgets to track their time. Thanks to automatic time tracking TimeCamp delivers very accurate raports. Application has enhanced securities by using encrypted conection . Everybody can try it for free for 30 days. Toggl (www.toggl.com/) is a time tracking program that is especially useful for freelancers or small business owners. Toggl can be used to record how much time is spent on each project and helps you to plan tasks ahead of time. Tasks can be set for billable or non-billable hours and can send records to clients with your logo attached to them. The differences are incredibly obvious, right? 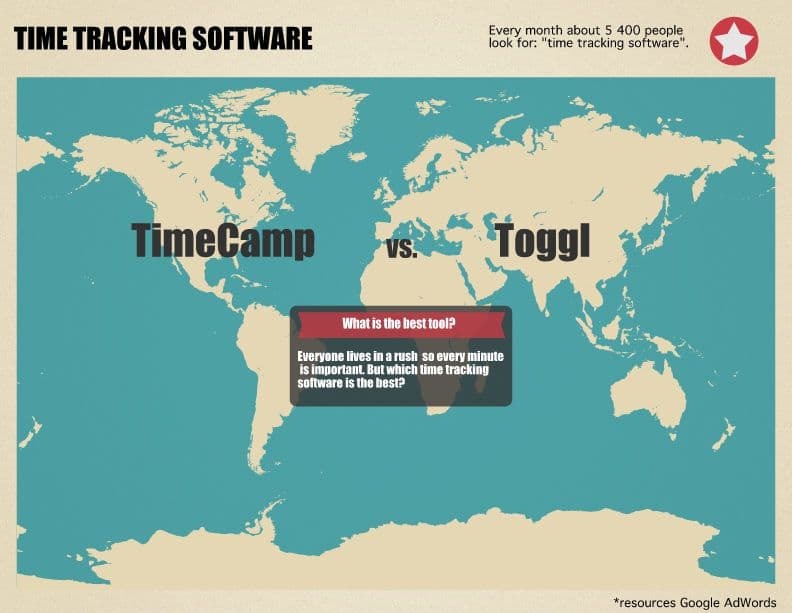 It’s a comparison of some of the time tracking tools. It is openly editable so that everyone could keep it updated. I think TimeCamp will fit perfectly on the sheet. If you still know some other software that tracks time, feel free to put it on the list. These two time tracking software are good. The comparison between the two gives us an idea on which is more efficient than the other. I hope that other time tracking software are listed too such as time doctor. I’ve tried using it for quite some time and I find it so accurate and efficient to track not just time but productivity as well. It shows the actual time spent on each task, poor time usage, websites visited and applications used during work hours. It also has random screenshots and it automatically logs you off when becomes idle for a couple of minutes.